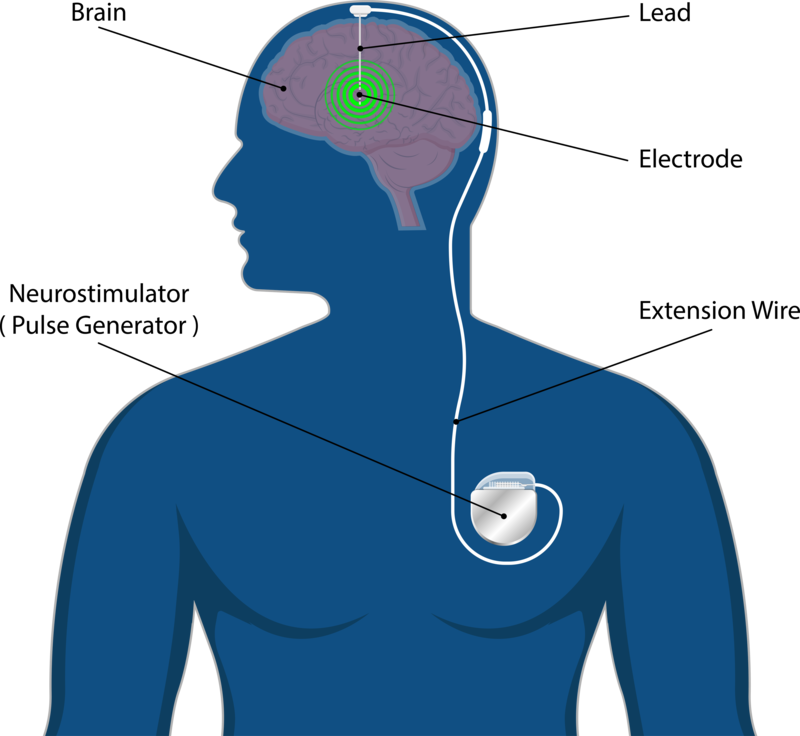 Current DBS devices are similar in construction to implantable pacemakers. Their size means that they must be implanted in a chest cavity with the leads routed through the neck. This is a common cause of discomfort for the patient and is also associated with risk of infection and lead breakage. 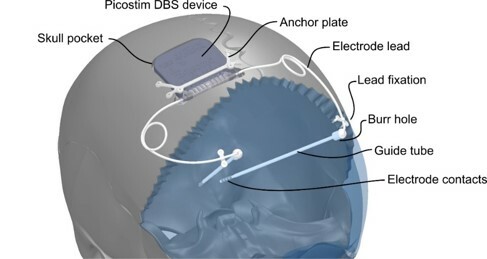 Existing DBS devices therefore require two procedures: one to implant the leads into the brain and a second to tunnel the leads through the neck to the device. In many centres, the leads and device are implanted over 2 days; but even in the most efficient centres, the procedure takes between five and six hours of surgical time. In the UK, the practical maximum number of cases for a neurosurgeon is currently 50-70 per annum. Consequently, there is a shortage of neurosurgeons and associated surgical infrastructure to treat the current patient population. Our Picostim device is one third of the size of current devices making it the only skull-mountable general-purpose DBS device available. Picostim can thus be implanted in a single surgical step, allowing two or more patients to be scheduled per day rather than one as is presently the case, significantly improving productivity of surgical teams. Picostim leads to shorter and simpler procedures and reduced requirement for revision surgery. Cost savings stem from reductions in resource utilisation and from reduction in medication expenditure as motor symptoms improve. An initial health economic study performed by the UK NHS assessed these savings to be up to £14 million per year for treatment of Parkinson’s disease alone. Picostim transforms the patient experience, with a better cosmetic appearance, no possibility of lead wire breakage or fibrosis around the lead in the neck, which is a cause of stiffness and pain, and is MRI compatible. Less time in the operating room and a one-stage procedure means less risk of anaesthetic complications. Performing the procedure through a single incision means that the risk of infection should also be reduced. Skull-mounting obviates the need for tunnelling of leads so the risk of lead breakage in the highly mobile neck region is eliminated. Picostim is recharged via a compact external inductive coil fitted into a baseball cap to ease placement over the implanted device. At typical settings for Parkinson’s Disease, a recharge is required once per week for less than 2 hours. This compares to 3-4 hours for conventional systems. Conventional devices are implanted in the soft tissues of the chest and reveal a visible outline; some patients develop a ‘twiddling’ habit which has been known to break the lead wires. Picostim is implanted in the skull, recessed into the bone like a cochlear implant, so there are no cosmetic implications. Using Picostim will significantly reduce treatment costs compared with conventional DBS systems. This stems from shorter and simpler procedures (saving about 40%). An initial Health economic study performed through SBRI assessed the savings for the NHS to be up to £14m a year if they were to use the Picostim system. Despite over 10,000 brain implants per annum, implantable systems that enable human research are limited. Picostim provides unique access for measuring human physiology in brain networks impacted by disease. Picostim’s monitoring function allows local field potentials to be recorded during and post implantation, with real time display of the frequency components of the signal. Chronic access to the brain networks, with the sensing and stimulation provided by the Picostim system, does not currently exist at a scale to transform clinical neuroscience. Picostim is designed to provide a state-of-the-art research system that has already received massive interest from the global research community. For example local field potentials recorded from the subthalamic nucleus in patients with Parkinson’s disease demonstrate prominent oscillations in the beta (13-30 Hz) frequency range with spectral power correlated with motor symptoms. With recording capability, the clinician can identify the correct electrodes straight away, reducing programming time and optimising therapy.